President Ivan Duque and the administration of US President Donald Trump suffered a major setback in their attempt to regain permission to spray glyphosate on Colombian coca fields, when a US jury–in a widely-watched case–ruled that the pesticide was a “substantial factor” in causing cancer. Duque, under intense pressure from the US to use the controversial chemical to curb coca production, asked the Constitutional Court earlier this month to undo its 2015 ban on the use of the pesticide. After health complaints by farmers, a lawsuit filed by neighboring country Ecuador and disputed results of aerial spraying, the court banned the use of glyphosate in 2015 to spray coca fields in US-funded operations, without must result. The US ruling has no direct connection with the decision before the Colombian Court, but its finding that glyphosate contributed to the cancer of a man from California, makes it more difficult for the Court to accept Duque’s request to resume spraying the chemical in large quantities. Glyphosate is the main ingredient in the world’s most-used pesticides, especially Roundup, which was invented by Monsanto, an old US chemical giant. Germany-based Bayer bought Monsanto last year for $63 billion, acquiring the legal problems associated with Roundup, including an estimated 9,000 law suits in the US alone. It is not known when the Court will announce its decision on whether or not to honor Duque’s request and allow again the use of the pesticide. In a hearing before the Court on Duque’s request, the only witnesses who favored restoring glyphosate use were either members of Duque’s administration or their hired consultants. All other witnesses, including scientists and farmers who had been exposed to the chemical, opposed overturning the ban on its use. Colombian and American critics pointed out that the previous aerial spraying had not only poisoned coca fields but nearby food crops as well, in addition to affecting the health of farmers and their families. And a December report by the US government watchdog, the Government Accountability Office, reported that spraying chemicals is a only a short-term way to reduce coca, since it takes repeated spraying of the same fields to ensure that coca does not make its way back into the farmers’ fields. Monsanto profited immensely from inventing genetically-altered seeds that yield plants resistant to glyphosate. This allowed farmers to spray their food crops and kill only the pests, not the crops. In the new court case, a San Francisco jury found that the Roundup Edward Hardeman had used to kill weeds on his property for nearly thirty years was a “substantial factor” in his developing non-Hodgkin’s lymphoma, a cancer which starts in the lymph system. Hardeman has gone through six rounds of chemotherapy. The verdict was in the first part of a two-part trial. This initial phase was intended solely to determine whether glyphosate was a major contributor to Hardeman developing cancer. Now that that issue has been settled, the second phase of the trial will begin. In this part, Hardeman’s lawyers will argue that Monsanto knew how dangerous Roundup and glyphosate are but attempted to cover up that knowledge in order to not harm sales of the very profitable Roundup. It is the second phase of the trial that would determine the damages Bayer must pay. This is the second glyphosate verdict reached in the US. Last year, a different California jury ruled against the company and awarded the victim $289 million. A judge later reduced the verdict to $78 million. 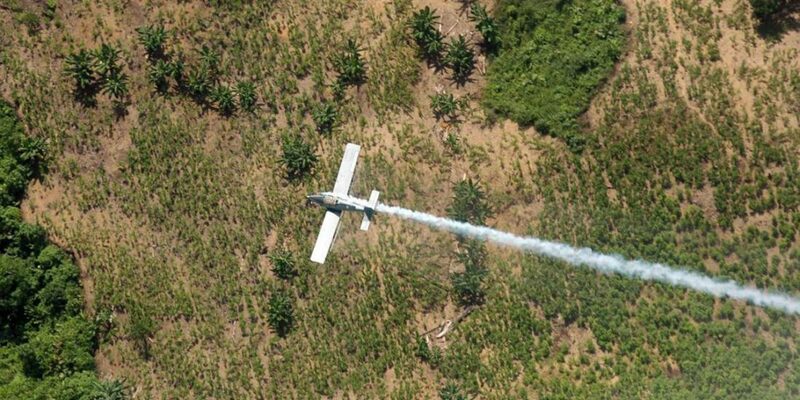 The United Nations have rejected the use of aerial spraying of coca crops in Colombia for years, implying the method was ineffective, contrary to rural development and voluntary crop substitution opposed by Washington DC and Bogota.